My boys love building things with LEGO bricks so I knew they would love to build something a little more challenging like a steel construction set. With our long summer I thought also this would make a great opportunity to do something constructive together and learn some engineering skills with a Eitech construction set designed especially for youngsters. Science toys are a perfect way to introduce concepts like engineering. The focus on studying S.T.E.M. subjects has gained momentum in just the last 5 years, especially for girls. My youngest, 8, was first tasked at building this as it was raining at the beach and he was curious. (the age on the box for the Eiffel Tower is 8+. He is a TYPE A child, like his father, so he first organized all the pieces. Within 10 minutes of trying to construct this he grew frustrated. Unlike other plastic building sets this is a European engineered book. So we put the stuff away, organized in their bags of course. Finally my husband found some time to help the boys and together managed to put the Eiffel Tower together. He admitted this was a little tricky but I think he had more fun than the boys. 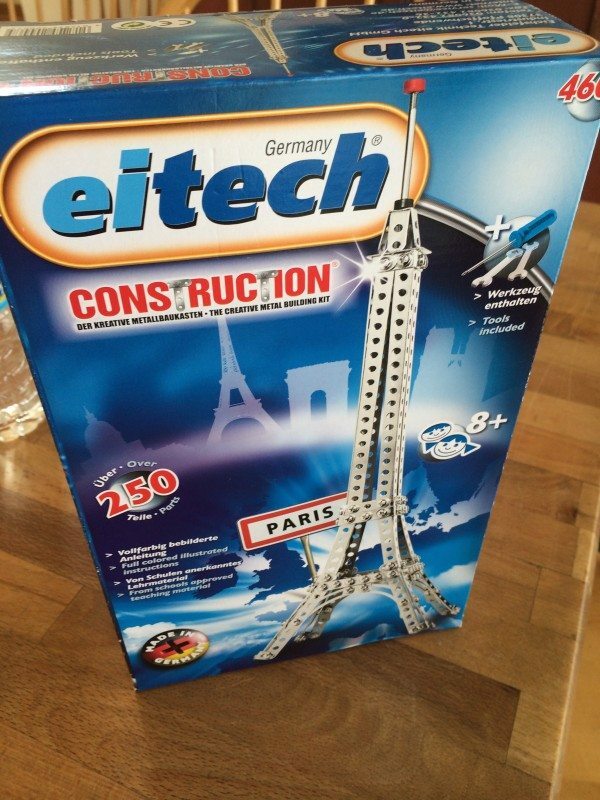 Not only can your kids build the Eitech Eiffel Tower Construction Set ($49.99) but also new this year is the Eitech Trail Bike Construction Set ($14.99). American children need more toys like this and less with new apps and electronics. Eitech toys have been introducing these concepts to European children for decades and now American youth can now join the STEM bandwagon. 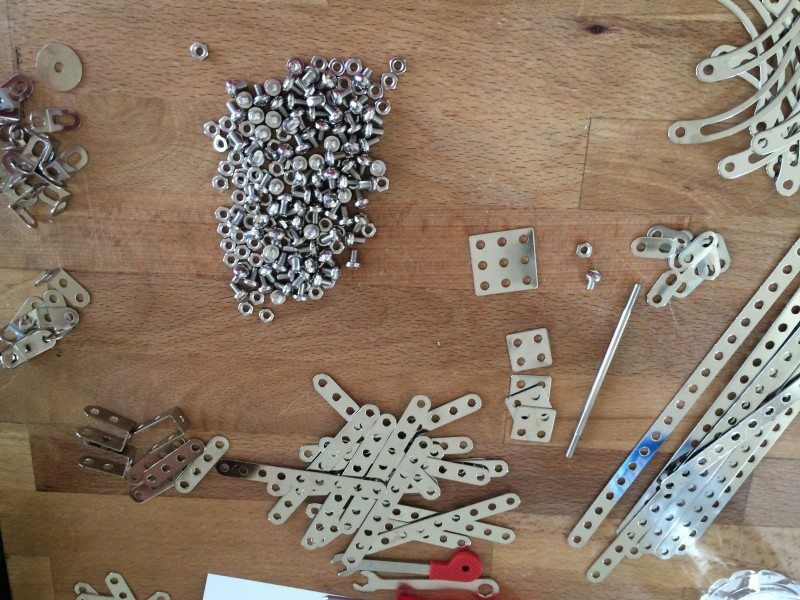 Using their fine motor skills to snap or screw together interchangeable parts, kids become little engineers in an afternoon of toying with age-appropriate tools. The full-color illustrated instructions allow youngsters to build by themselves although it’s always fun when a parent or older sibling joins in. These would make great Christmas gifts too to keep them occupied over the holidays. You can purchase Eitech Construction Sets at www.eitechtoys.com, Toys R Us, FAO Schwarz, and online mega shops like amazon.com and drugstore.com plus specialty sites like yoyo.com. I would choose the Robot set to work on with my grandsons! They love doing things like this and we would really enjoy spending the time together on such a fun project! I would choose the Eiffel tower for my daughter. I like the space shuttle construction set for my 10 year old nephew…he would LOVE it! I would get the robot for my nephew. He love Legos so I’m sure this would be super cool to build! This will be perfect for my 12 year old nephew for xmas. Even if I don’t win I’ll buy one. It’s too perfect. Probably get the robot. I would pick the Train and I would give it to my nephew. I think he would really love building this with my Dad! I would choose the robot set for my son. He loves building toys, so he would love this! I know my boys would love something like this when they’re older, I’d even like it right now. Great post. 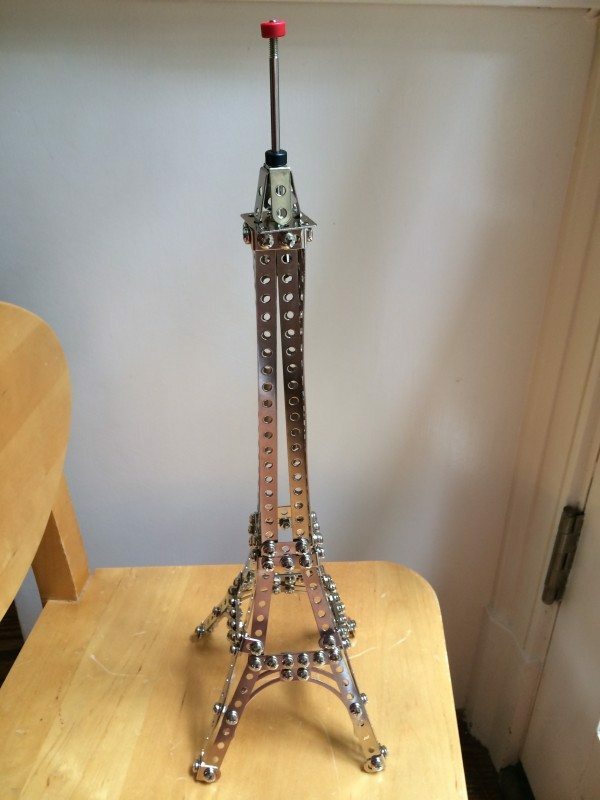 I love the Eiffel Tower Construction Kit, so this is what I would chose for my granddaughter. I think she would have a blast building this with her dad (my son).